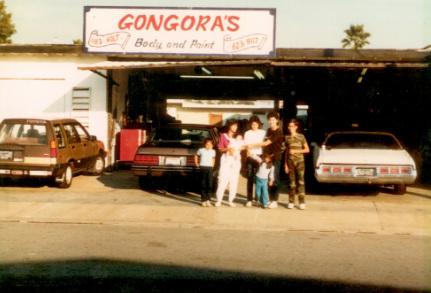 Gongoras Body & Paint family owned and operated since 1979 in the city of Pomona, California. Our shop specializes in insurance claims repairs, classic car restoration, all collision and frame repairs, as well as custom automotive painting. From the moment you arrive at Gongora's Body & Paint our courteous and knowledgeable staff will assess the damage and assist you in any towing, rental cars, or insurance questions you may have. Gongoras utilizes trained and certified technicians and offers a written lifetime warranty on all body repairs. Having your vehicle damaged is challenging with the additional worry of wondering whether the repair experience will go as smooth as possible. From the moment you enter our shop, until the day you pick your repaired vehicle up, we never quit working for you, always putting your needsfirst. Each job we complete will meet or exceed your expectation, its our personal guarantee! We realize that while this is a day-to-day business for us, most people are experiencing the process for the first time and sometimes going to the larger production shop can make you feel like just another number, but here at Gongoras, we treat everyone like family. In addition to repairing vehicles damaged by collisions and auto accidents, our expert technicians also restore vehicle damaged by time. From classic cars to street rods, we return rusted, damaged, and non-working vehicles to their original glory. Using the finest reproduction and original parts, we transform your old, worn vehicle into a fully functioning work of art. Quality and Service. It's our goal to provide our customers with the highest quality and service on your vehicle. The Gongoras staff is prepared to deliver the quality you deserve. Throughly inspecting every job before delivering and constantly monitoring each customer's vehicle progress. You can trust our years of experience to repair your vehicle right the first time.